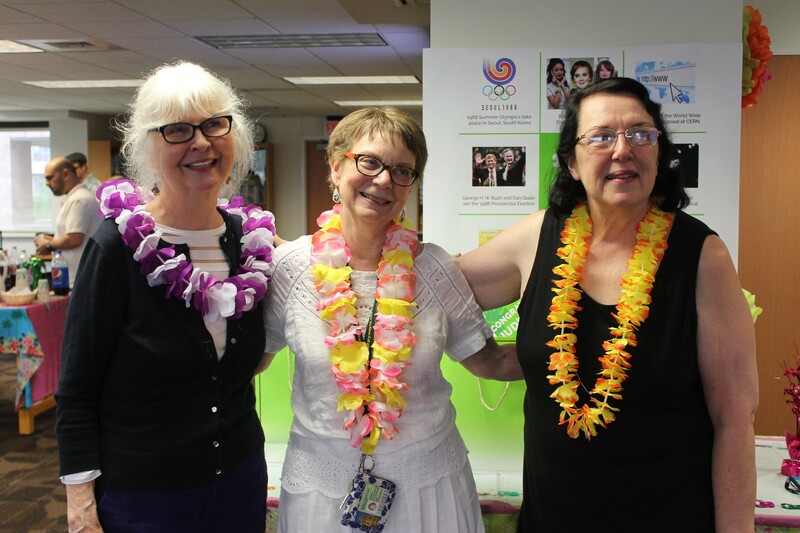 On July 12, Wayne State University Library System celebrated the retirement of three librarians: Judith Arnold, Diane Sybeldon, and Nancy Wilmes. Diane (MLIS '98) and Nancy (MLS '85) are SLIS alumnae, so we caught up with them to get their insights on librarianship after so many years in the library world! Enjoy your new adventures, Judith, Diane and Nancy! In photo, left to right, Diane Sybeldon, Judith Arnold and Nancy Wilmes . Photo courtesy of Vinnie Roberts. You have sometimes taught courses for SLIS. From your experience, what can SLIS students do both in and out of the classroom to prepare themselves for their future careers? Seek answers to the questions inside your head. You have been outstanding support to students and faculty in role as library liaison for topics and departments including art, art history, theatre, dance, film studies and media collection. What recommendations do you have for library liaisons who want to provide outstanding service to their departments? At it's best, I think the liaison role is about developing positive, personal relationships, that grow out of shared, professional interests and responsibilities. Looking back on your career, what would you say is the most fulfilling aspect of your work in libraries? those related to identifying or developing resources related to the history of the Cass Corridor and Detroit area arts community, which were then made available to our students as well as the campus and outside communities. Through library displays, our online and physical collections, library instruction sessions, etc. these resources provide a wonderful look at the creative work that has occurred in and around Wayne State for over fifty years. Our creative community is important, and acknowledging its history and its research value, is the highest compliment. Some of the projects include the Cass Corridor Culture installation at the Undergraduate Library, the Detroit Focus Gallery Collection and online Detroit Focus Quarterly, the Cass Corridor Documentation Project of art and music oral histories, the Alternative Press Collection archive, the Detroit Poetry Collection, the Detroit City Poets oral histories, the Motown Research Collection, and the Grande Ballroom concert postcards collection. The list could go on and on. As part of all this, collaborating on projects with Wayne State faculty and staff, including the University Art Collection's coordinator Sandra Schemske, was also very fulfilling. The university's collection has a strong focus on Cass Corridor art, so we were of common mind. There were many enthusiastic collaborators on the poetry side of the arts, including faculty professors Todd Duncan, Melba Boyd, and M.L. Liebler; a number of local poets and poetry publishers; a Canadian researcher and documentarian named Monika Berenyi, and fellow librarian Judith Arnold. Do you have any other comments or thoughts you'd like to share with the SLIS community? Good luck to all of you - this is a very exciting world you're walking into! What advice do you have for those who are new to the library and information science professions? Get involved in a professional organization like SLA or MLA. This will allow you to interact with other Librarians and at the same time you will constantly be learning the new developments in the profession. Your role as Biological Sciences, Chemistry and Geology Liaison for Wayne State University Libraries has been vital to helping those respective departments as well as their faculty and students. What recommendations do you have for library liaisons who want to provide outstanding service to their departments? A liaison should be in constant contact with their departments whether it is in course-integrated teaching of library resources, or merely talking with faculty and students in an informal manner. Looking back on your career of over 30 years, what would you say is the most fulfilling aspect of your work in libraries? The most fulfilling aspect was that I was able to interact with so many faculty and students in biology and chemistry. I am a librarian, but my first training/job was as a biology and chemistry teacher. Any other comments, insights, or topics you'd like to mention or talk about? It is so important to interact with other librarians to gain their perspective on how they work with their faculty and students in their liaison departments.